Speed & Strength Black Widow Jacket: I've Been Bitten! Don't worry, you don't actually have to be a widow to own this next piece. However, armed with this jacket, you may soon become one! The Speed & Strength Black Widow Jacket for women is all attitude and all bite. If you bark louder while wearing one, we would completely understand. 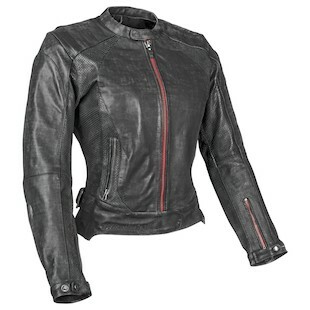 Shorn from premium cows to a 1mm thickness, the leather chassis on this jacket is supple and flattering. However, the distressed treatment and perforation panels sends another message! I'm already reading you loud and clear, but just in case you need some extra oomph, the Black Widow also comes with reflective trim. A subtle red accent on the front zippers confirms the Black Widow motif, but an over-the-top spider emblem on the back seals the deal. Speed and Strength really paid attention to the details with this one. The accordion panel at the lower lumbar, the expansion zippers at the hips and the side "Lockdown" waist adjuster all add a practical function and a custom fit, but they sure do look badass in the process!